In his late 20s by the mid-1930s, Ron Drummond was born in Los Angeles, raised in Hollywood and, as a kid, summer vacationed at Hermosa Beach. During summers, in the 1920s, Ron learned to bodysurf and then board surf. He was particularly into canoes and bought his first one around 1921, at the age of 14. On a dare from his brother, he dragged his canoe out into the surf only to have the canoe broken in two by a good sized wave. 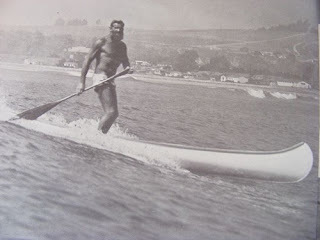 Undaunted, a tall (6-foot, 6-inches) Ron “Canoe” Drummond would go on to become known up and down the Southern California coastline, eventually canoe surfing waves as large as 15 feet. The tall, lanky Drummond became a track star while attending UCLA in the mid-1920s, specializing in discus and the shot put. Throughout his life he continued to swim, canoe, and bodysurf on into his mid-80s. “But anyway, all I was going to say is, I wanted to be an adventurer, too. So, that’s why [when] I was studying mechanical engineering at UCLA… I just figured, well, [mechanical engineering] really doesn’t interest me... So, I heard that Eastern Canadian Mining Company was sending canoe expeditions out to unexplored areas to get the geology of it, so if they ever found anything that was favorable for the deposition of minerals, why, they’d send probably 40-50 prospectors in there. So, I saw the manager of this company when he came out to Los Angeles. I heard he came out every year on business. He’s a nice fellow. He sort of patted me on the back. He said, ‘Well, son, we only hire graduate mining engineers and geologists.’ So, that let me down. Anyway, the next time he came out I went to see him again. He said, ‘You’re really interested, aren’t you? You’re really enthusiastic.’ So I said, ‘Yes, sir!’ So he said, ‘Well, I’ll tell you what you do. You spend a year studying the subjects that I tell you to, and then we’ll give you a try on one of our expeditions.’ So, I studied mineralogy and geology and pre-Cambrian shield and blowpipe analysis and all that sort of thing that’d make me of some use to them, and then I got on with them. In 1931, Ron was the first one to publish a primer on bodysurfing, entitled The Art of Wave Riding. 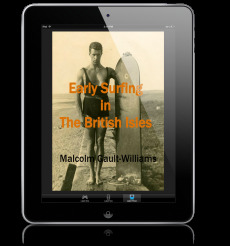 At 26 pages and a print run of 500 copies, the small book is one of the first books ever published about surfing. “One feels sorry for those who have not learned to enjoy surf swimming,” Ron wrote in his intro. “To spend a day in the sand developing a ‘beautiful tan’ is pleasant; but the real pleasure of a trip to the beach is derived from playing in the breakers.” Elsewhere in the book, Drummond defined “glide waves” and “sand busters” and step-by-step bodysurfing instructions. Understandably, this booklet has become a prize amongst collectors. “When was this?” asked Gary. Drummond’s “close calls” did not keep him from seeking bigger and bigger surf to paddle his canoe into. 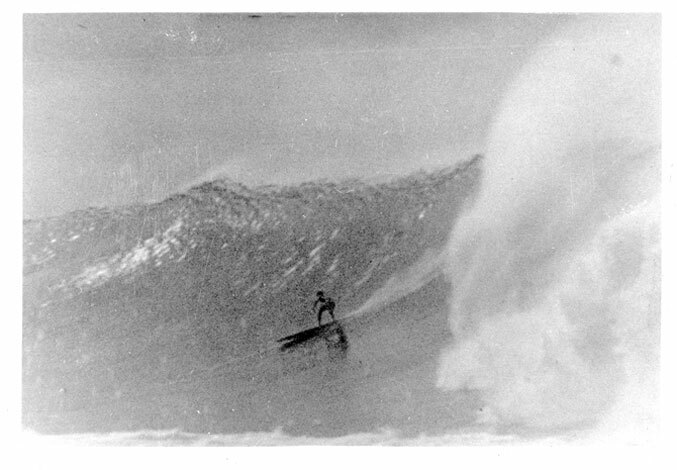 During and after the war, he joined a select group of Southern California’s best watermen to ride California’s then-known biggest waves at the Tijuana Sloughs. 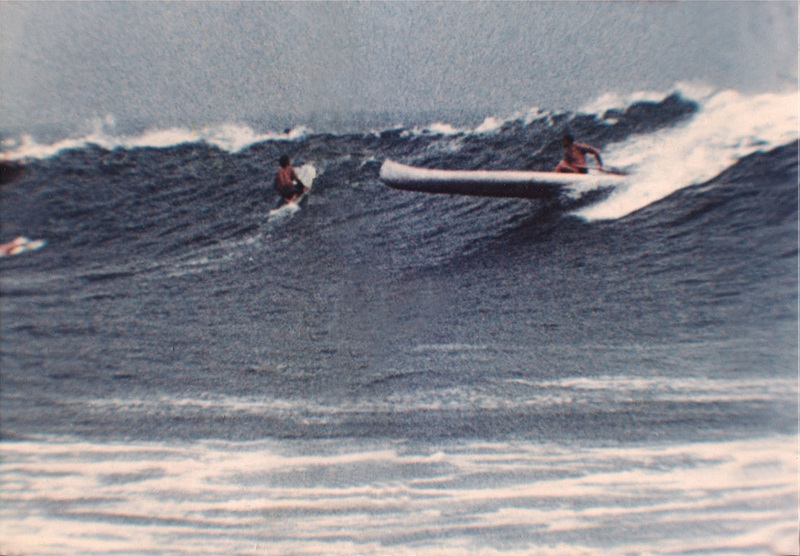 Ron went into a little more detail with Gary Lynch, probably talking about the same wave: “Did I ever tell you about the big wave I caught in a canoe down in the Tijuana Slough? … Boy, that was a whopper. That was about forty feet high, I guess. I was right inside the curl. Boy, I thought I was never going to make it… That was [another] one of my close calls… I guess. “Dempsey [Holder] was the chief lifeguard down there…” On the day when Tommy Zahn and Peter Cole came out, after Dempsey had called them to get down to Imperial Beach pronto, Tommy and Peter paddled out, were amazed at the size of the waves and further amazed to find Drummond already out there… “out there where the big waves were breaking, ‘cause Dempsey talked to me later and he said I’m the only one that had ever ridden those big waves. They were about 20 feet high in near shore. That’s where he was, I guess. Warshaw, Matt. The Encyclopedia of Surfing, ©2003, p. 168. Lynch, Gary. Interview with Ron Drummond, July 30, 1988. Drummond, Ronald B. The Art of Wave Riding, ©1931, Cloister Press, Hollywood, California. Dedina, Serge, 1994, p. 37. Lorrin Harrison quoted. Dedina, Serge, 1994, p. 37. Ron “Canoe” Drummond quoted. Warshaw, Encyclopedia of Surfing, ©2003, p. 168. Hi, How history gets written ... :-) I enjoyed reading this interview with Ron (never heard anyone call him 'Canoe' but I suppose some might have done so). Ron was my great-uncle, an extraordinary man with a great love of life and the sea. He was an environmentalist, an unbelievably talented surfer . . . and a great story teller. Later in life, he spent hours writing a book about his 'near death experiences' -- encounters with sharks, tigers, and abnormally large waves. As a young man, he did have many genuine and magnificent adventures in India, Africa (I have a picture of him with his arms around a lioness), Australia, and out on the ocean, but he also loved to spin a 'yarn,' so to speak. I think if he told Gary Lynch a story about my great-grandfather (his father) encountering head-hunters, he was pulling his leg -- straight through the eye of the old yarn spinning wheel. Ron had a wonderfully wicked sense of humor. Ron's father was a mining engineer, born in Ceylon, educated in Scotland, who worked for many years in the silver mines of the west and then retired first to LA and then to an apricot ranch south of LA where he grew the best tasting apricots I have ever tasted . . . Thanks for (researching and) posting this outstanding set of tales. Legends indeed. Kia ora from New Zealand.